A close reading of the memoirs of the Pandits in exile weave a tale of horror and sheer desecration of basic human rights. Most narratives of displacement and suffering make it clear that women bore the brunt of the inflicted atrocities. In this context, Indu Bushan Zutshi’s memoir She was killed because she was an informant; no harm will come to you provides a poignant narrative of the persecution of a Pandit family in Anantnag in April 1990. The onset of spring, the season of socialising and ‘picnics’ has been ironically juxtaposed in the memoir with the declaration of curfew and widespread infiltration of militants and terrorists into the Kashmir Valley. The Panditmajority mohalla, as described in the memoir, is sparsely populated as most Pandit families had fled due to death threats issued by militants against them. In the midst of these circumstances Shambu Nath Bhat, a teacher by profession, mourns the death of her lone daughter Sarla Bhat (in her twenties), a staff nurse at the Sher-I Kashmir Institute of Medical Sciences in Soura. Having been abducted from her hostel on 15 April, four days later, her mutilated body was found in the downtown area of Srinagar. A hand-written note attached to the body accused her of being a police informant. The trauma of confronting the reality is aptly summed up by Zutshi as the police force handed over the body of Sarla to her family: “We were horrified to see the body when it was handed over to Sambhu Nath. It was bullet-ridden and covered with blood. There were torture marks all over the body. It became clear to us that she had been violated and sexually assaulted before being killed”. For several other Pandit families, exile was an outcome of prolonged trial and slow smouldering protracted persecution. In case of families which did not provide any apparent signs of provocation there were other means of intimidation. In fact it was not unusual for Pandit houses to be targets of random stonepelting by masked youngsters. Ironically, as some memoirs affirm, in several cases, the masked youngsters were mostly adjacent neighbours. As Meenakshi Raina recounts in her autobiographical Nights of Terror: ‘On a cold December night in 1989, a bunch of masked youngsters threw stones at our house in Srinagar. We suspected some of them to be our neighbours. They knew who we were and what we did. They shouted our names and jeered at us. We switched off the lights in the rooms and huddled inside. The din of the stones smashing against the rooftop was so loud that it felt as if it was raining stones from the sky. Most of the window-panes shattered and pieces of glass lay scattered everywhere inside the house… That night none of us slept as fear gripped each one of us. Even before this incident, my father had received a threatening letter from a militant organisation, warning him to leave Kashmir.’ As fear gripped the entire family, most of the members moved to the relative safety in Jammu. For most senior citizens, adjusting to displacement from home was even more traumatic. As Meenakshi Raina captures the experience of her grandmother: “When my grandmother arrived in Jammu, the look on her face was horrific. I will never forget that look. I comforted her by telling her that we would be safe now”. For most victims, escape implied clinging on to the last dregs of hope. Several families desperately tried to safeguard their traditional legacies. As Meenakshi Raina points out, her father handed over a satchel containing her mother’s jewellery to her grandmother: “My grandmother held the satchel close to her chest while travelling to Jammu. While handing it over to my mother she mentioned ‘Moklaye Kashmir’ (Kashmir is finished)”. For senior citizens, the trauma of displacement left an indelible imprint on the mind. As shared in this narrative, the grandmother reflected on how they had spent the night of 19 January in terror, apprehension and deep insecurity. She was haunted by the slogans cried by the local militants to hassle the Kashmiri Pandits: Assigacchipanunuy Pakistan, Batavrostuybatinensaan. (We want our Pakistan, without the Pandit men, but with their women). Similarly, in her memoir The Day I became a Tourist in My Own Home, Minakshi Watts iterates the sufferings inflicted on the elderly: “What pains me the most is how it changed the lives of my elders ~ my parents and grandparents. The lives that once sparkled with adventure and laughter now carry unspoken stories of a gruesome past, the wounds, and the atrocities inflicted upon us by militants and their sympathisers and supporters”. Ironically, as some memoirs affirm, in several cases, the masked youngsters were mostly adjacent neighbours. As Meenakshi Raina recounts in her autobiographical Nights of Terror: ‘On a cold December night in 1989, a bunch of masked youngsters threw stones at our house in Srinagar. We suspected some of them to be our neighbours. They knew who we were and what we did. They shouted our names and jeered at us. We switched off the lights in the rooms and huddled inside. The din of the stones smashing against the rooftop was so loud that it felt as if it was raining stones from the sky. Most of the window-panes shattered and pieces of glass lay scattered everywhere inside the house… That night none of us slept as fear gripped each one of us. Even before this incident, my father had received a threatening letter from a militant organisation, warning him to leave Kashmir.’ As fear gripped the entire family, most of the members moved to the relative safety in Jammu. For most senior citizens, adjusting to displacement from home was even more traumatic. As Meenakshi Raina captures the experience of her grandmother: “When my grandmother arrived in Jammu, the look on her face was horrific. I will never forget that look. I comforted her by telling her that we would be safe now”. For most victims, escape implied clinging on to the last dregs of hope. Several families desperately tried to safeguard their traditional legacies. As Meenakshi Raina points out, her father handed over a satchel containing her mother’s jewellery to her grandmother: “My grandmother held the satchel close to her chest while travelling to Jammu. While handing it over to my mother she mentioned ‘Moklaye Kashmir’ (Kashmir is finished)”. For senior citizens, the trauma of displacement left an indelible imprint on the mind. As shared in this narrative, the grandmother reflected on how they had spent the night of 19 January in terror, apprehension and deep insecurity. She was haunted by the slogans cried by the local militants to hassle the Kashmiri Pandits: Assigacchipanunuy Pakistan, Batavrostuybatinensaan. (We want our Pakistan, without the Pandit men, but with their women). The din of the stones smashing against the rooftop was so loud that it felt as if it was raining stones from the sky. Most of the window-panes shattered and pieces of glass lay scattered everywhere inside the house… That night none of us slept as fear gripped each one of us. Even before this incident, my father had received a threatening letter from a militant organisation, warning him to leave Kashmir.’ As fear gripped the entire family, most of the members moved to the relative safety in Jammu. For most senior citizens, adjusting to displacement from home was even more traumatic. As Meenakshi Raina captures the experience of her grandmother: “When my grandmother arrived in Jammu, the look on her face was horrific. I will never forget that look. I comforted her by telling her that we would be safe now”. A critical reading of most of these writings in exile exposes the complex intricate nature of the experience of displacement in contemporary history. Trauma, as revealed in most of these narratives, seems to have been initiated as a rude intrusion into the erstwhile peaceful existence of most victims in the Kashmir valley. In most cases, intimidation gradually paved the way for terror and coercion that ultimately forced the Pandits to leave the valley and seek refuge in Jammu and other parts of north India. 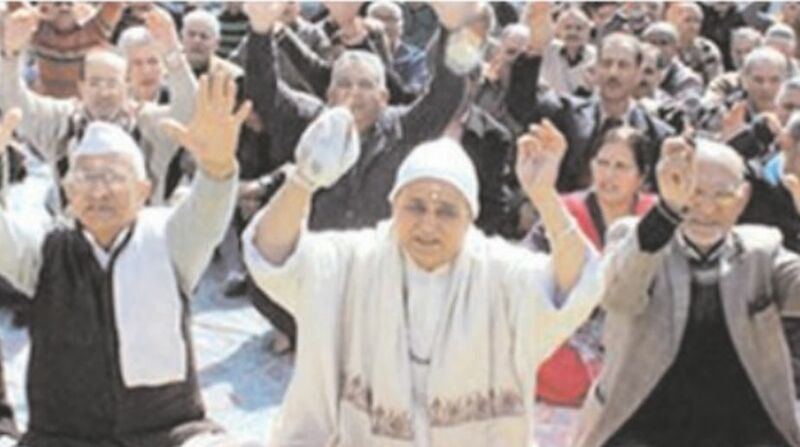 From stone pelting to jeering, intimations operated in multiple ways and initiation of trauma had a ripple effect on the victims as it triggered one crisis after another. As the writings discussed in this essay reveal, the trauma of displacement often lead to a fresh chain of personal and emotional struggles for most victims, as displacement often leads to a new struggle of adjustment in a totally new set of circumstances.